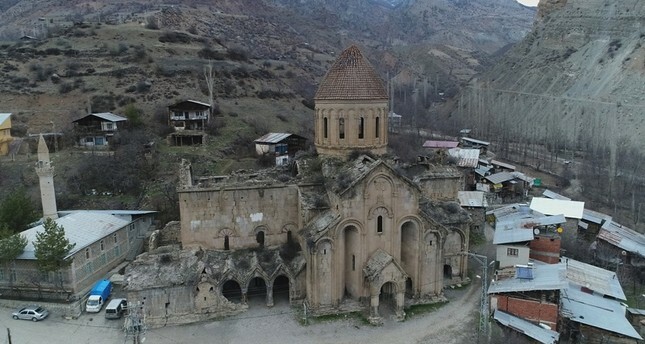 Historical Öşvank (Oshk Vank) church, located in Turkey's eastern Erzurum province will boost tourism in the region after its restoration is finished, Governor Okay Memiş said Wednesday. Located in Uzundere district, the church was part of a monastery and an important religious center for the area's Christian community during the rule of a Georgian dynasty. Launched by the Culture and Tourism Ministry, restoration works of the church had started last year with the goal to restore the historic structure to its former glory. Noting that Anatolia has been a home to various cultures, Memiş said the mosque next to the church is an indicator of tolerance and acceptance. The stones used in the construction of the church were taken from a nearby stone quarry, that still stands although it is currently not used. Officials have noted that they will use authentic stones extracted from the quarry for the church's restoration. With its ornate architecture and inscriptions, the church is a popular attraction for local tourists as well as tourists from neighboring Georgia. A wooden pillar that replaced a marble column is among the reinforcements that prevent the century-old structure from collapsing.